UPDATE at 4:30 PM | A MULTI-vehicle crash is causing delays on the M1 on the Gold Coast. The accident happened in the southbound lanes at Arundel about 4pm. Traffic was backed up for at least eight kilometres at the time of writing. It’s also slow moving southbound outside Dreamworld. UPDATE @ 1.15 PM | Holiday makers are being urged to remain patient on the M1 this afternoon with traffic already building ahead of the long weekend. 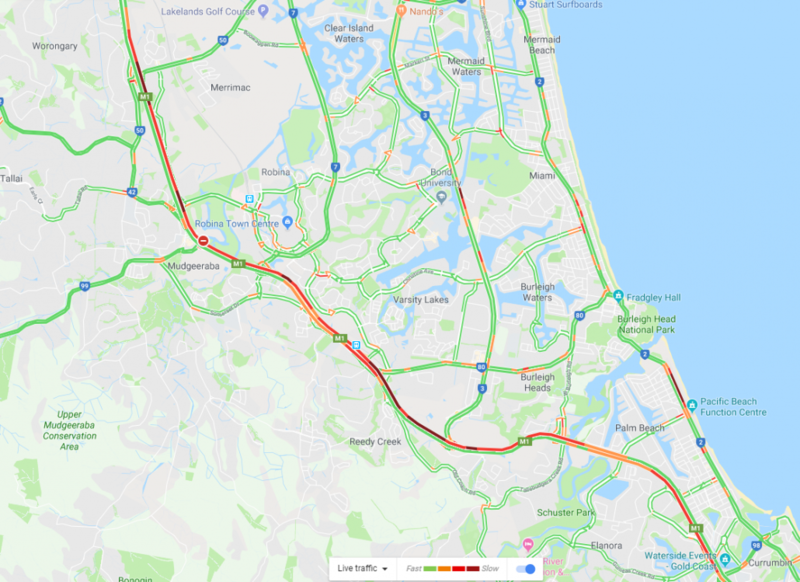 Gold Coast motorists are experiencing standstill delays on the Pacific Motorway southbound from Worongary to Mudgeeraba. The stretch from Varsity Lakes down to Currumbin is also heavily under speed, while southbound traffic at Eight Mile Plains in Brisbane is also building. Drivers are being advised to avoid frustration on the roads by leaving home earlier to give themselves a little more time. Motorists heading into NSW are also being reminded that double demerit points and hefty fines are in place across the whole long weekend, including today. The double demerits will be in force for speeding, seatbelt, mobile phone and motorcycle helmet offences. “This weekend is all about getting from A to B and ensuring everyone can make it back home – not sacrificing safety in moments of possible impatience while driving,” police said.